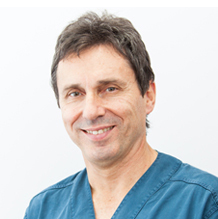 Paul has over thirty years experience as a dentist in both dental and general hospitals and general practice. He has an approachable manner and is passionate about dentistry which he also believes should be fun! Paul graduated in dentistry at Newcastle University in 1982, having won the class prize in oral physiology. He held hospital appointments in dental, oral and maxillo-facial surgery in Bristol, London and Chichester before entering general practice on the south coast. Following a year in New Zealand he returned home to the West Midlands in 1988 to help establish the practice here in Monkspath, Solihull. Paul has studied with some of the most eminent clinicians in dentistry. After extensive clinical and academic training, he was awarded a Masters degree in dental implantology from the University of Sheffield in 2005. He is recognised as a registered specialist in oral surgery by the General Dental Council. As well as his work as principal dentist at Paul Lowe Dentistry, Paul is a clinical lecturer in Primary Care and Clinical Practice at Birmingham University Dental School and is an associate specialist in oral surgery at Birmingham Dental Hospital. Paul is a member of numerous professional bodies including the Association of Dental Implantology and the British Dental Association.